Sacramento Kings rookie and No. 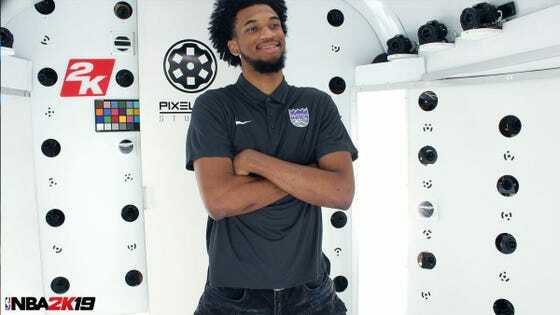 2 overall pick Marvin Bagley III will be rated a 78 overall in NBA 2K19 when the game releases on September 11. The 19-year-old big man from Duke averaged 21 points and 11 rebounds in his lone year in college. Bagley helped lead the Blue Devils to the Elite Eight where they fell to the Kansas Jayhawks. Still, his accomplishments in Durham, North Carolina weren’t enough to produce an overall rating higher than No. 3 pick Luka Doncic. On Friday, we learned Doncic would be receiving a 79 overall. Last year, No. 2 pick Lonzo Ball was rated a 79 overall and the No. 3 pick Jayson Tatum (another Duke alum) was at a 77. Obviously, we know Tatum would go on to have a better rookie season than Ball, but it’s a little rare to see the No. 2 pick rated lower than the guy at No. 3. The fact that the gap is two whole points makes it even more eye-popping. Overall, it seems ratings are up across the board and that’s something I’m still trying to understand. I’m still trying to get an interview with the man in charge of ratings to put the numbers in the proper perspective. At any rate, like every other player in the league, Bagley will have an opportunity to improve his rating over the course of the season. Last year, Tatum went from a 77 to an 82 by season’s end. Sacramento is hoping they will see a similar spike in productivity and development from their Duke rookie.